I am happy to announce that our Butterfly Gala bundle is back in stock and ready for Spring. This beautiful Butterfly Gala stamp set has several different butterflies and beautiful sayings to go along with them. There is even a matching punch to cut out your butterflies. I have designed our April Class in the Mail around the Butterfly Gala set. I have created four different designs. You will receive cards supplies and envelopes. With our Stampin’ Up! On Stage convention and the Easter Holiday weeks coming up, time is tight, so I will be offering our April class in the mail. The deadline to RSVP is April 12th. Use Host Code AJE4U7P3 and order the bundle on line #150599. Your kits will be FREE. I will bill you $7- to mail your kits and directions or you can have porch pick up for FREE. This class is only good in the U.S. If you already have the bundle and only want the kits and directions, e-mail me at Stampfunatics@gmail.com and I will bill you $19.95 ( shipping included). 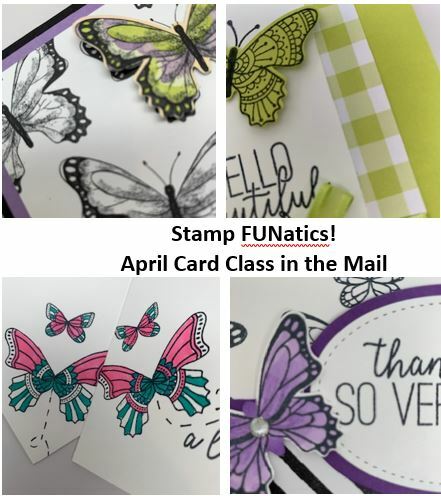 This means all you have to do is e-mail me at stampfunatics@gmail.com and let me know you are interested in purchasing the April class. I will bill you by Pay Pal and your kits will be mailed on April 15th. If you have all the supplies and only want the tutorials, I will bill you $9.95 and will e-mail you the tutorials. You will need Memento ink, and Blends, Colored Pencils or your favorite coloring medium. I will supply all the embellishments, designer paper and cut pieces. You will need the butterfly punch to punch out the butterflies. Now you can create from the comfort of your home.